How to find and keep a job in ANY economy! Unemployed?Have a job, but worried about losing it? You're not alone. Unemployment is the highest it's been in 26 years. "In this unstable economy, job security is a thing of the past. I'll show you how to guarantee that you will never , ever live with the fear of being unemployed again." Unemployment numbers are at their highest in 26 years and getting worse. Competition for jobs is stiff. I knew there was a problem when I realized that almost all of my friends and family members were out of a job. I knew I could teach them the secrets that I learned about staying employed for life, no matter how bad the economy was. You'll never hear the secrets in my seminar from anyone in HR. And you won't get any of the typical advice they would give you. Most people know that typical job searches don't work, but they don't know why. I'll show you why they don't work and how you can rise above the talent pool even if you're less qualified. You'll learn secrets about how to land dream jobs, and how to create dream jobs for a lifetime of job security! The job market is bleak, but here's the good news... there are jobs! You just need to know where to look for them. And even more important, you need to know how to look for them. And not just ANY job. High-paying and flexible jobs you never knew existed. How would you like to get cushy, high-paying jobs like these? What do all these jobs have in common? I have done them all and got all of them without an agent, recruiter, or HR. None of them were on a job board, classified ad or online. And I didn't have any experience or training for any of them. I got them all by using the techniques I'll teach you in my seminar. I was in the same situation you are in years ago. I was forced to learn a new way and it worked. It worked so well that I've never been without a job since, and I never will. I promise if you follow the strategies outlined in the seminar, you will never again worry about being employed. And you will wake up ever morning eager to get to work because you will be making more money doing something you're passionate about. Once I figured it out I couldn't believe how many years I had suffered in dead-end jobs or waiting for the other shoe to drop when I did find a good job. I'm now an award-winning inventor/author with a patented product that's sold in 24 countries. The product, swiggies, the wrist water bottle, was a NASDAQ product of the year semi finalist and has been seen in countless magazines, newspapers, and TV shows around the world. I run multiple businesses that I started from scratch with little or no money and they're all profitable. And it's all because I heard the words "You're fired!" Years ago I was working a job I hated, but stuck with it because, well, it was a job and I needed the money. The pay was horrible, my boss was a jerk, and I had no chance to ever move up in the company. One day I booked a TV commercial for a phone company and showed up on the set at the crack of dawn to shoot it. I called my boss (while the cameras were rolling) and told him I wouldn't be in that day. He said "Don't bother coming in at all... you're fired." I couldn't believe it. As I'm smiling for the cameras, inside I was crushed. Here I was working on a commercial, my dream job, and I was getting fired for a job I hated, and I was still crushed. It was my security blanket. My steady, though lowly paycheck. After months of looking for work and getting nowhere, my unemployment and savings were running out. I started to panic. My back was against the wall and I had to figure something out quick. All of the typical ways of looking for a job weren't working. So, I came up with a new strategy. I vowed that from then on I would never work a job I hated and I would make more money in less time. I promised myself I would never hear the words "You're fired" again...and I never have. This is NOT a resume/interview seminar. In fact, I barely mention either of them. For all of the great jobs I have gotten, I didn't even need a resume, and I rarely ever had an interview. I'm going to tell you how to skip all of that. "I wish I had used these techniques two years ago..."
"This seminar forced me to rethink my job search strategy. After wasting almost two years submitting my resume to literally hundreds of jobs and job sites, the techniques & strategies taught in Job Security for Life is really what has opened the doors for me. I've already had several follow up interviews with VPs and now I'm currently negotiating my contract for hire. I wish I had used these techniques two years ago!" Julie Austin's job seminar offers a unique perspective in terms of going about finding meaningful employment. That is, that the more one is in the "driver's seat", the better the chance of getting a position that is satisfying in a personal way, as opposed to settling for one that is ready made for everyone and no one in particular. Enjoyable and thought provoking, with an entertaining slide presentation. "The material in Julie's seminar is golden!" " If you're unemployed or want to make sure you never are, you have to get this course. It has advice you won't find anywhere else. I highly recommend "Job Security for Life" to anyone who wants a lifetime of job security. What are the consequences of extended unemployment? The effects of long-term unemployment are devastating. A typical 40 year old will lose 20% of their lifetime savings. Long gaps in your resume paint an unfavorable picture to employers, and a worker who has been unemployed for long periods of time may lose the ability to acquire new skills and eventually also lose the skills they have acquired over the years. This doesn't even count the health issues involved with chronic unemployment, and the stress it puts on people mentally and financially. Those who do have a job are now worried about keeping it, even if they are unhappy working there. Because of wide-spread layoffs, workers who do have a job are putting in longer hours for less pay, and are watching their benefits slip away. Many companies are putting off filling full-time positions with benefits. Almost 70% of U.S. companies surveyed recently expect no change in full-time hiring in the near future. How much would you be willing to pay for the secrets to staying employed for life? How much would you pay to find a good, high-paying job right now? To find your dream job? $1,000...$500...$250?? How about a one time payment of just $97.00?! YES Julie, I want in! I'm ready to secure my future with job security for life. I'm ready to learn how to get a job and keep a job the entrepreneurial way -- even in a bad job market! BONUS #1: "The Job Security for Life" workbook, a step by step plan to put you on your way to a lifetime of job security. This is a $24.95 value. BONUS #2: A copy of the ebook "A Pink Slip is a Gift", full of guidance and inspirational stories of people who seized opportunities after getting fired or laid off and turned them into a success story. A $12.95 value. 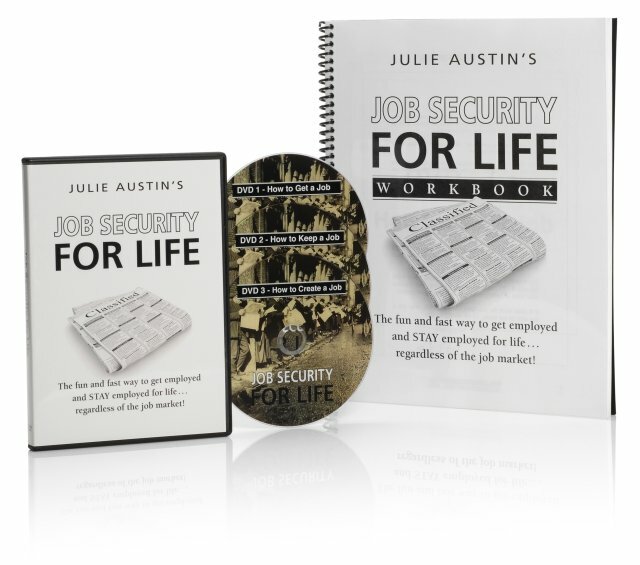 The whole "Job Security for Life" package, including the 3 DVD seminar, bonus workbook, and ebook "A Pink Slip is a Gift" are yours for the very low price of just $97.00! This is a one time offer. The price will be going up. So don't wait! This course will change the way you search for jobs, and after applying this knowledge you will never, ever be unemployed again... make sure you don't miss your chance to change your life. What do you have to lose?